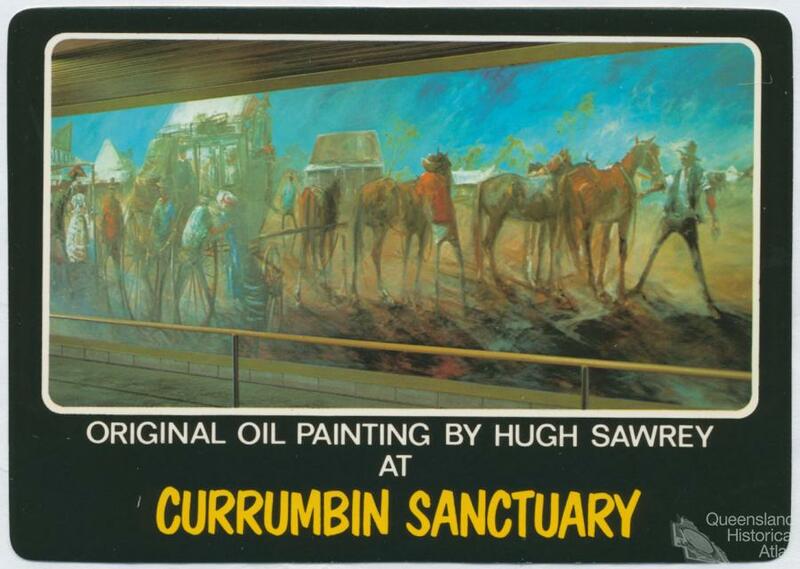 Hugh Sawrey became one of the best known painters of the Australian outback. Inspired by bush poets and his own outback experiences, his first major works were murals in Queensland pubs. He went on to paint cattle musters, pack horses, Indigenous stockmen, and outlying stations – almost always in harsh outback settings, depicted in strong, uncompromising colour. 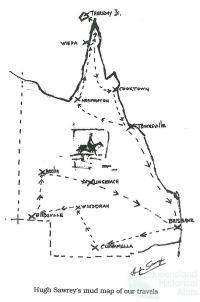 He celebrated the independence and hardiness of outback workers and the centrality of the horse in outback life. Whether Australians live on a tram track or a mulga track, they have something of the outback in their psyche, according to a commentator in the Weekend Herald, Gold Coast, 22 May 1993. The Outback is still to be discovered ‘beyond the black-stump’ but the hardiness and independent character which shaped Hugh Sawrey’s youth and early manhood has been eroded by mechanisation, increased communication and the drift to the cities. In the decade since his death in 1999 the depopulation of 'the bush' has even increased. Sawrey was born at Forest Glen, near Buderim in 1919 but as his timber-getter father was killed when he was just three years old he followed his mother Jean through various station properties in outback Queensland where she worked as a cook. He left school at age 14 and found his first job as a jackeroo at Jessievale Station in the Gulf Country and for thirty years went droving (apart from his war service in New Guinea) and working on cattle stations in northern Australia. He was largely self-taught as an artist but when he decided on a career in art took lessons from Caroline Barker and Jon Molvig in Brisbane. He recalled that ' ...after a hard day's work in the saddle, he'd join his mates around the campfire and, as the flame flickered on their faces, they would recite the poems of [Henry] Lawson, [AB 'Banjo’] Paterson and [Will] Ogilvie who captured the spirit and the hazards of the bush, and the men and women who lived in it', as reported in the Sunday Mail, Brisbane on 2 February 1997. These bush poets inspired the murals he decorated pubs in regional Queensland with such as Kogan Creek where his mother had a property. Because of the positive reception of these murals he came to Brisbane in May 1963 and introduced himself to the art scene by submitting work to a competition organised by Lawrie Quinn, the host of the Royal Hotel, Queen Street. One of his first non literary watercolours, Stock camp boys, took first prize in the section. The Royal Hotel was just near the premises of Queensland Newspapers, publisher of the Courier-mail, and it was the journalists preferred watering hole. It was here that Sawrey met Lawrie Kavanagh who was to be his principal chronicler. Keith Moore at the nearby Grand Central Gallery offered Sawrey his first solo exhibition in 1965 and as his popularity developed he purchased a property at Coomera and established a Quarter horse stud. Sawrey transferred operations to a larger property outside Boonah in 1972 before finally moving to Bangtail, a property outside Lurg, Banella, Victoria in 1978. In the Forties in the Channel Country it was mainly horse work. It was open country and we mustered from one waterhole to the next. The men and women took pride in what they were doing and took pride in their gear... Today, it's motorcycles and four-wheel drives, a real mechanical age. It's a shame. This concern, to preserve the spirit of the pioneering years of the pastoral industry in Queensland, inspired both his art and the establishment of the Australian Stockman's Hall of Fame which was officially opened by Queen Elizabeth on 29 April 1988 at Longreach, western Queensland. As his career developed he sought subjects which directly related to his own experiences in Queensland’s outback and continued to make yearly trips lasting 3-4 months through regional Queensland. His best documented expedition was in the company of Kavanagh, the Courier-mail journalist, who provided the text to Sawrey's sketches of sites and incidents along the route to Cape York in 1991 and the Channel Country in 1992. Most of Sawrey's paintings are undated so it is difficult to relate them to specific trips and many have their locations identified as just Western Queensland ― one so titled was unfinished when he died. The landscape of vast swathes of the Queensland outback are quite featureless so Sawrey's depictions of mustering cattle on the plains of the Channel Country or along the tree strewn Coopers Creek depend on titles to locate the scene to a specific site. Names such as Moraberrie, Bramwell, Springvale or Kogan appear with some consistency in his work and reflect the properties where he worked — or country towns such a Boulia. The clues to the location of other works are provided in the painting itself. For instance in The landlord's hope for the Isa Cup . . . we know the landlord was the proprietor of the Duchess Hotel (south of Mount Isa) as the name is emblazoned across the building. The role memory plays was important. When Sawrey discussed in the Courier-mail on 16 January 1986 the largest painting he produced, Tilbooroo cattle along the Paroo River, which was exhibited at Galloway Galleries, Brisbane in 1986 he asserted that 'they are all scenes, all recollections of my past'. But are such recollections always authentic? Take for instance, The rabbit seller at the Tattersall's Hotel, Winton, Qld. There is indeed a Tattersall’s Hotel in Winton but the two-story timber building in the town is quite unlike the wrought-iron swathed building depicted which looks more like a hotel in country Victoria. Neither have rabbits been abundant enough to have a rabbit-o in town although such activity may have struck a chord with Australians growing up in the cities during the 1930s. Oral traditions were hugely important for Sawrey as he moved from Queensland to live in Kelly Country when he determined to paint a series on the famous 'outlaw'. In 1985 Sawrey produced a series of works relating to the nineteenth century cattle-baron Sir Sidney Kidman (1857-1935), the largest landowner in Australia. 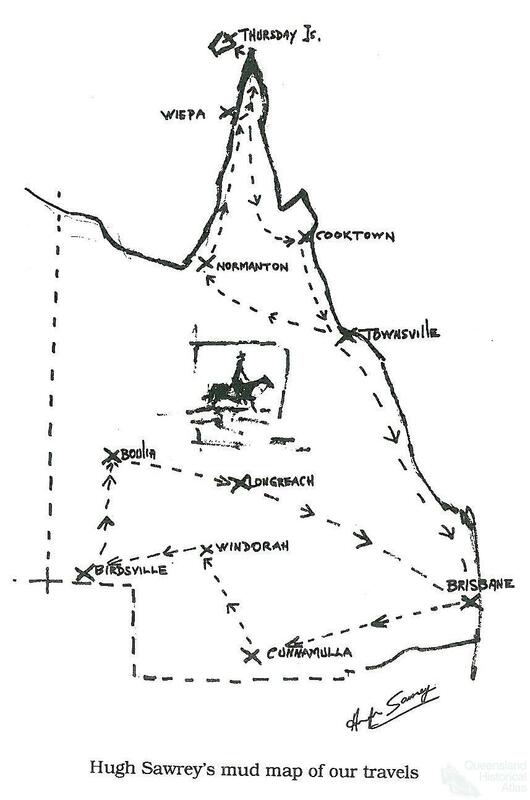 Sawrey depicts Kidman in relation to his vast holdings in the Channel Country ― where, apart from across the bar of outback hotels, he would have heard of Kidman discussing the movement of his herds with the stockman known as 'Mudmaps'. In a sense Sawrey revived the tradition of history painting in Australia ― it wasn't the epic poems of the Greeks that inspired him but Australian bush-poets; it wasn't high moral values that were espoused but the values of mateship and it wasn't the heroism and valour in long ago battles but the heroic effort to wrest a livelihood from the unyielding Queensland outback.